Peanut Butter Pie Recipe with peanut butter, cream cheese, and whipped cream in graham cracker crust. This recipe came from ladies in my employ over 30 years ago. They ate lunch daily at a restaurant because this delicious pie. One day after lunch they came bubbling through the door. They had jokingly ask for the recipe and to their surprise got it. 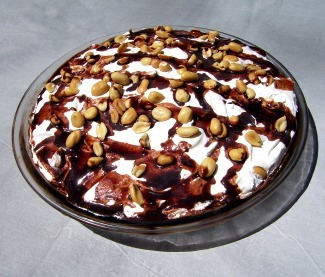 I added the topping of whipped cream, chocolate sauce and nuts. Cream together cream cheese and peanut butter on medium speed* until smooth. Reduce speed to low and powdered sugar a little at a time (prevents the sugar from flying everywhere). Fold in 1/2 (6 oz.) of the whipped cream and mix thoroughly. Pour mixture into graham cracker crust, spreading evenly and mounding slightly in the center. Spread the rest of the whipped cream over top of pie, mounding slightly in the center. (The mounding is for aesthetics, only). Sprinkle roasted peanuts over top. Place pie in the refrigerator to chill several hours before serving. The flavors will blend and the pie will cut better. You can freeze this pie. Remove from freezer and let it thaw enough to cut before serving. The colder it is when served, the more like an ice cream pie it will taste. *Beating on medium speed produces a more dense pie with more of a peanut butter taste, in my opinion. For a lighter, fluffier pie with more volume, beat on high speed. You may substitute a Vanilla Wafer Crust. A chocolate cookie crust is very delicious also. Make according as per the vanilla wafer.